Introducing the up and coming student artist Hans Chew!!! Currently studying his final year in School Of The Arts, Singapore (SOTA). Recently, he created a work called Not “Always $2”, 2015 which is now on display outside the SOTA gallery on level 2. What you will see is a vending machine carrying pieces and pieces of handmade, thrown ceramics works, painstakingly created and fired piece by piece. Make no mistake, though these pieces may look mass produced (which they were… BY HAND) they were made individually by Hans himself. The pieces all have an allocated slot and allotted price in the machine, and can be bought like any other drink or snack vending machine. But unlike some gallery pieces that are only for show and lack audience-artwork-artist interaction, you, as the audience can actually purchase the work. Do not worry, your pieces will not break because of the drop. In fact I believe it adds a risk and theatrical/performance factor to the entire piece. This entire installation seeks to bring attention to the artistic making process, from conception to even selling a work. In his concept excerpt, Hans mentions that in our highly mechanized society, represented by the vending machine, the traditional aspect of handmade ceramics and pottery is being “largely compromised”. By doing so, there is not only the loss of interaction between the artist and his works, let alone the audience. 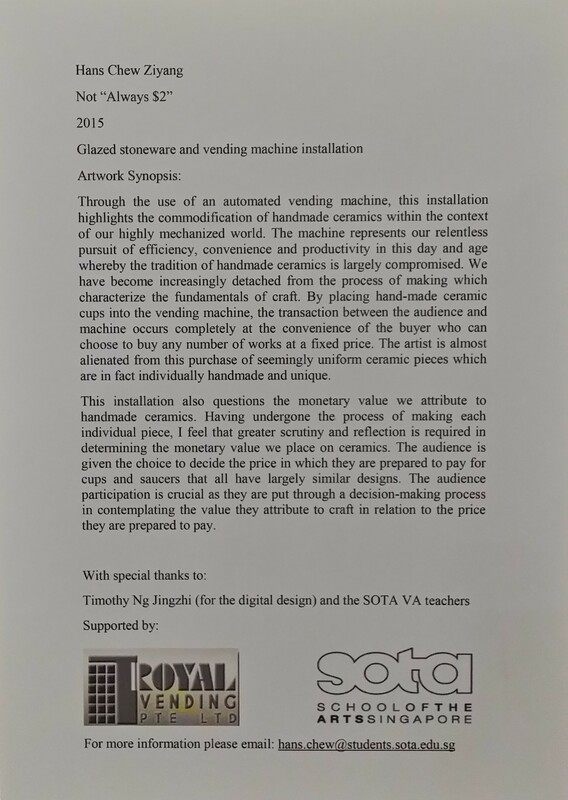 Even though pieces are handmade and unique, he mentions that the transaction is between the “audience and machine” at the “convenience of the buyer who can choose to buy any number of works at a fixed price”. Bearing in mind the concept of price, Hans goes on to bring up the monetary value of handmade ceramics pieces, and how greate r “scrutiny” and “reflection” is required in determining the monetary value of each piece, taking into consideration materials, firing, glazing, rental of the machine and the painstaking, time-consuming creation of each piece by the artist himself. By putting similar pieces at different prices, he forces the audience to become an integral part of the entire concept, as they have to “attribute to craft in relation to the price they are prepared to pay”. Personally, this work speaks volumes of what art is today. Questions such “does the artist’s hands really matter in the process?”, “can mass produced ‘pieces’ reconsidered art?” and “if the work is manufactured by machines or collective body, does it still retain the individualistic, craftsmanship by the person who conceived it?” are coming up more and more in this art era. Works by artists such as Andy Warhol come to mind, and there always lies that age old question – “what makes an artwork, an artwork?” Today even well known artist are asking others to create their final display work. Whether these pieces are too big for one person to handle, or it is part of the concept, I do not know and do not want to judge. However, I believe that if there is a choice by the artist to make the work himself, no matter how massive, there are good reasons that value add to the concept of that work. The concept of pricing is also a rather sensitive topic. Someone once told me “how expensive you decide to price your work depends on how much you cannot bear to part with it”, and I believe in that entirely. To artists, each work produced is their bread and butter, yet at the same time, they must also decide which carries more value – the integrity of the work or “surviving” off the piece. Similar to what Hans’ concept raises, people may not always accept high prices no matter how aesthetically pleasing it is to them and no matter how much they want to give to the artist. For all you know, an expensive piece may merely be the going at the cost price of its materials. Time IS priceless after all. The first point is targeted at audiences and buyers, which is the value of works. For those who do not dabble in the Visual Arts, or have little experience, let me say that each stroke and mark has a reason behind it. It is within the Visual Arts that the phrase “do not judge a book by its cover” plays a significant role. When a viewer judges a work, he must not only take into consideration what he perceives, but the entire process itself. The work may seem deceivingly simple, and the first thing that may come to the layman’s mind would be, “I can do that too”. But can you recreate the artist’s process? The process may have been deep and reflective on the part of the artist, time and money, even blood, sweat and tears could have literally been put in to push this idea he believes in out to the public, you. For those who support the arts through monetary means of purchasing pieces, the gravity of the matter is that you, as the buyer are not only participating in the work, like Not “Always $2”, but you are also supporting, believing and, ultimately, buying the concept in its entirety. So understand the piece, beyond the tangible and perceivable and reflect on the impact that a work can have on yourself. The next point would be towards artists and students of the arts. (Keep in mind that this is just an opinion.) Works that you create must also have a reason behind them. The artwork, like your eyes, are windows to your mind and soul. Do not create works that you are half-hearted about, because people will eventually see through the facade. You, yourself will also realize on hindsight that there was little value in creating that work. Do not do it for the grade or the recognition, because your entire process from conception to realization has a value, monetary or verbally, that will not only be judged by audiences, but yourself as well. Nevertheless, PLEASE, please support Hans in this endeavors and consider purchasing a piece before they all run out. Like all handmade pieces they are still unique in their own way. But before all that just stop… and consider all that I have said, particular the value of concept. After all, how many can say they bought a unique handmade ceramic piece out of a vending machine. To continue where I left of, this is one of two climaxes of my play. By now those who have been reading are familiar with my work Tabula Rasa. Exhibited in Asia’s only sustainable light festival, iLight Marina Bay Singapore, Tabula Rasa is a light installation piece within a shipping container. The container was part of nine other containers stacked up one on top of another to form a three-by-three square grid to form an artwork by the New Zealand art collective/studio Storybox. In order to make their work more interesting, they invited various schools in Singapore to submit proposals on installation pieces that could utilize the space within the two containers that sat on the base layer. One of the schools was Laselle, College of The Arts and the other was mine, representing School Of The Arts, Singapore. This piece was a major turning point of my artistic process for many reasons. For one, this piece made me think beyond the physical aspects and elements of a space, forcing me to look beyond into metaphysical elements such as sound, wind and light. In many ways, I feel that most developing and practicing artist forget that these invisible elements play crucial roles in the interpretation of an artwork. I, for one, look at all works with this in mind. Ingrained deeply in me are the words “respect the space” and with that planted a seed that continuously tells me to be aware of the space that I am in. This has allowed me to perceive environments in more ways than the usual first impression and contemplate the possibilities of that space whether I use it or not in the future. In addition, the fact that this piece was to be put under the public eye made both the journey and the final product things that had to be carefully considered. Questions like “how will the audience respond?” and “what would people think?” constantly haunted me during the process. As a student artist, audience may be forgiving on some level, however, the fact that it is open to the elements means that you are attempting to impress an idea upon people, who will in turn project their response whether it be desirable or not. Ultimately, your passion for the idea will show through, and, as I believe, people will see into that piece of your soul which you have laid out to the public eye and choose to accept it or not. It is the moment that YOU or I can make an impact. It was a turning point of change for both maker and viewer. In this piece I used light and a smoke machine to create walls of light, much like the light curtains used in technical theatre. In contrast to those in theatre, I created these walls to be horizontal rather than vertical. 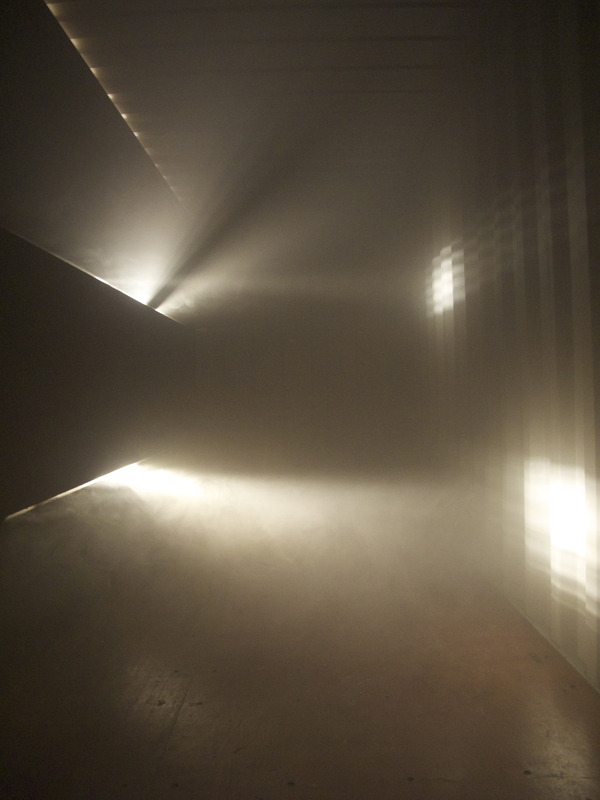 This was achieved by constructing a false wall that was flushed to the left side of the container which housed both the LED lights as well as the smoke machine. After fixing the lights and the smoke machine in place, a curtain draped over the gap and the entrance in order to conceal the fixtures whiles simultaneously preventing the excessive escape of smoke from the container. Other than these four components, the rest of the container was left empty for people to walk in and immerse themselves into the installation. 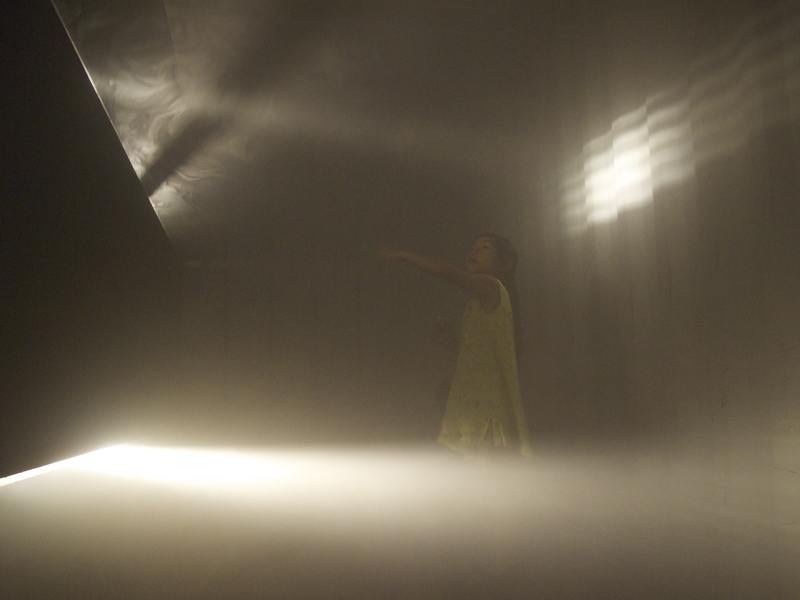 From the entire duration of the exhibition, the lights would be left on and the smoke machine was programmed to release burst of smoke at regular intervals to maintain the atmospheric effect within the container. 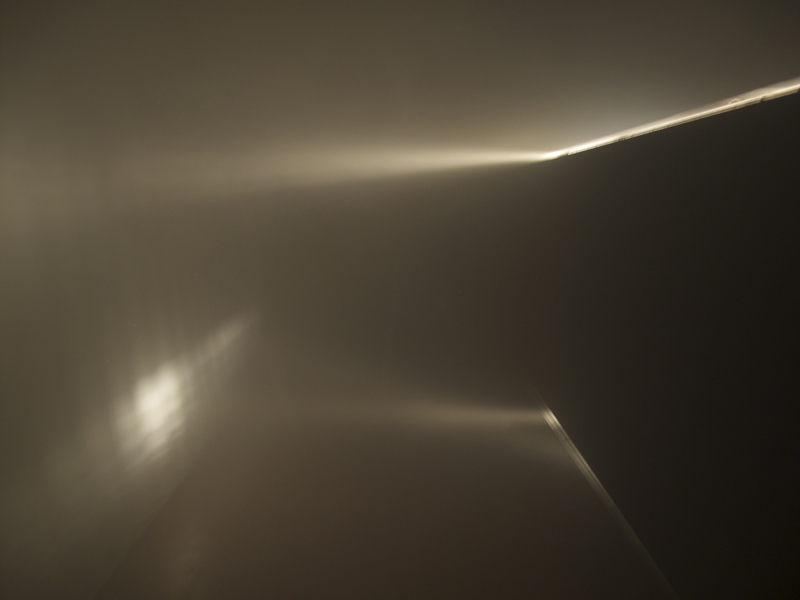 The objective of this installation was to sensitize people to the space that they were entering and to make them question “what exactly was the artwork?” By this atmospheric effect within the container, I wanted to see if people realized that as they stepped in, they became part of the work. I hoped that they would be able to “feel” their bodies being severed from their heads and legs due to the walls of light and realise the impact of lighting on any space, thereby emphasising how simple, minimalistic metaphysical elements can change not only a person’s impression of the space, but also change the impression of how others view them in that space. As can be seen from the images above, a children may have been the only ones who manage to fully experience the environment created. I believe that with their imaginative capacity and sense of playfulness, they saw exactly what I intended the artwork to do. This brought to mind yet another revelation – sometimes we need not be so serious in viewing works that we have to judge them whenever we see them merely because we have the capacity to do so. Being perceptive and fully aware is one thing. But being quick to judge and criticize falls under an entirely different category. Let us first soak in the atmosphere, the piece’s and our surroundings before we start to analyze and attempt to appreciate what lays before our eyes. Mind you, that I said “attempt to”, as I know that to honestly appreciate something is easier said than done. All in all, this work gave me an opening and also opened my eyes by exposing me more to the world of an artist. Not a “student artist”, but a full, practicing one. I could go on and on with the epiphanies and revelations that flooded my mind and have continuously been doing so, but I shall leave it at that and hope that you take some time to decipher my almost cryptographic handwritings in the following posts that they may both enlighten and inspire you as those revelations have greatly inspire me. I understand that it has been a while since my last post and once again I have to apologize for it. I know that for those who have been reading or popping by to check, I have been apologizing more than I have been writing about anything else. I begin at this odd hour before procrastination gets the better of me. This time, things are going to change. To bring you all up to date of my current situation, I have just finished my military stint in the Singapore Armed Forces (SAF) – Army. Although some will say that serving in the military dulls the faculties of the mind, and I am not going to deny it, it has opened my eyes to new things and allowed me to learn to take things from a different angle. I have been blessed to travel to three different countries and view the marvellous scenery that is so often overshadowed by the concrete jungle. These experiences have allowed my eyes to soak up nature as what it originally was intended to be before being marred by human hands and capture it both in the mind as well as in photographs. Priceless moments that I will never forget spent with friends and brothers for life. I hope that you will bear with me as I attempt to rekindle my artistic flare and journey to find the language and path that will express as vividly as possible my inner most thoughts and processes. So, journey with me to unveil what lays ahead.